I was excited when assigned to review the Incubus/Deftones show at the 360 Amphitheater near Austin, Texas on August 8th. It had been a while since I had reveled in 90’s era rock music. 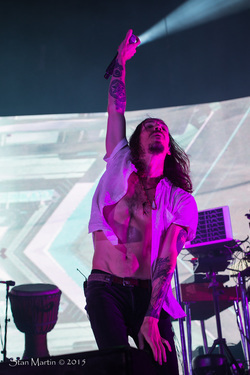 I was not familiar with the current music of Incubus, which left me as an unbiased spectator with a lot of work ahead of me. I arrived at 6pm in the heat of the day. First up were brothers Mikaiah Anaiah Lei from California. Together they make up The Bots, named by Rolling Stones as Most Likely to Succeed in “20 Best Things at Coachella 2014’s Second Weekend.”. While Mikaiah danced freely on stage and played guitar, Anaiah kept steady on the drums. They were fun to watch, and the audience seemed to enjoy their music because of how lively they were on stage, along with their musical abilities. Next came Death From Above 1979. This high-energy duo gained widespread recognition upon their debut in 2004 with You’re a Woman, I’m a Machine. Bassist/synth player Jesse F. Keeler and drummer and vocalist Sebastien Grainger are both from Canada, where they met and formed Death from Above in 2001 (the “1979” was added later). The band put on an amazing set, and warmed up the stage for Deftones by getting the crowd involved with the energy of their music. By the time Chino Moreno and the Deftones took the stage, the sun had gone down and a slight breeze had barely started to cool things down. Chino opened an ice cold bottle of water and proceeded to sprinkle it at the audience, then threw the bottle into the crowd. I could definitely see and feel his charisma, and it’s easy to understand why he is so well loved, along with his band. Many of the fans there had been anxiously awaiting the Deftones. The fans enjoyed chanting along to their songs and dancing in the aisles! The party was really going now. heard lead singer Brandon Boyd’s urgent longing on Wish You Were Here, off their double platinum CDMorning View released in 2001. They are great lyrics, and I really liked them! They played this song midway through their set as the deafening crowd went wild singing along. Brandon Boyd (lead vocals, guitar), Mike Einziger (piano), Jose Pasillas, (drummer), Chris Kilmore, (keys), and Ben Kenney,(bass and vocals) stayed the course and performed expertly. As their set came to a close–and Brandon’s shirt came off–I realized the whole thing had felt like a vacation. Isn’t that what music does best, regardless of genre, is transcend you to a place far away like no other means of transportation can do? 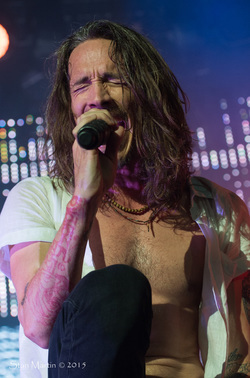 Based on their fanbase and loyalty, Incubus will no doubt be there whatever tomorrow brings. Longtime fan Lauren from San Antonio said, “Two amazing rock bands with distinctively different sounds under one starlit sky. The energy and crowd involvement was nothing short of my expectations. There’s something about singing the lyrics to your favorite band along with 10,000 other people who are just as excited as you are, it’s dope. Deftones played all the classic hits from your wish list and Incubus sounds just as epic live as they do blaring from your speakers. This concert was definitely one for the books!